Carl is the president of the Cleveland based North Coast Fossil Club as well as their webmaster. His best fossil find is that of an Acanthodian spiny shark that turned out to be the oldest-most complete jawed vertebrate in the fossil record at 425 million years old. The specimen was donated to the Royal Ontario Museum in Canada and published in PLOS ONE, August 2014, Vol 9, Issue 8. Carl received his B.S. in biology from Xavier University, his Masters in Education from Cleveland State University class of 1988 and has retired after teaching science for 35 years in the Cleveland City Schools. 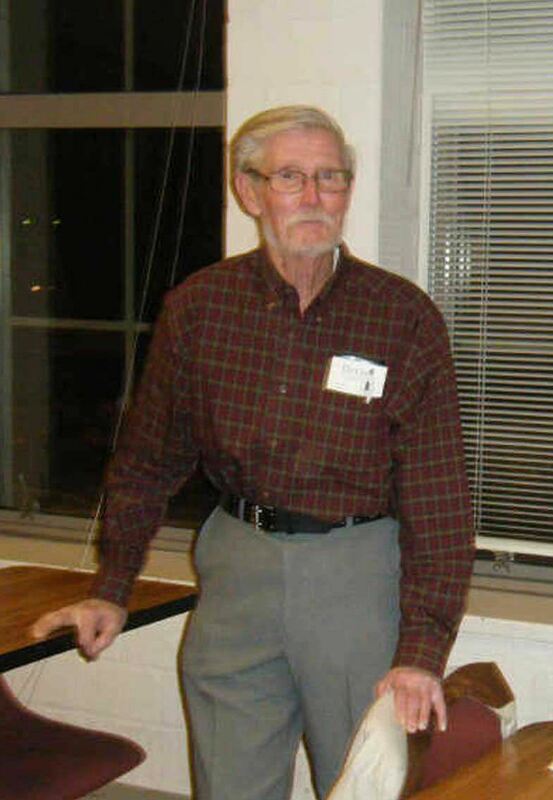 Carl taught computer programming at the Cleveland State University College of Education for 10 years. There will be no Beginner’s Class this month as room 301 will be used for the silent auction. Some of our field trip sites expose one or two formations; however, our April location exposes four separate formations! You can have your pick from the Whitewater, Liberty, Waynesville and Arnheim. Gastropods, pelecypods, brachiopods, a variety of coral, crinoids, and trilobites abound throughout this road cut, known as Southeast Indiana. We will begin at 10:00 AM on Saturday, April 27th. While there is traffic along the route, there is plenty of parking along the sides. Parents do not allow your children to cross this road without your help. We have often referred to this place as a “sure thing” – you will find a variety of fossils there. Experienced fossil collectors know where their favorite layers are, and are happy to show newcomers. If you are not a member, but would like to attend the field trip with us, email Bill Heimbrock at billheim@cinci.rr.com and he will get you the information you need. If you are not a member, but would like to become one, Join now by clicking here. The April fund raising auction is ready to go! The list of items to be offered in the auction is at the end of the E-bulletin so you can plan ahead. More items have been added since this list was published in last month’s bulletin. If you want further information about any item you can contact me at paleojack@fuse.net . Remember that your purchases help the Dry Dredgers fund our outreach and grant efforts. Auction rules reminder: This is a silent auction. Once we have the auction set-up in Room 301, members can start bidding before the meeting. No bidding will take place during the meeting and program. At the conclusion of the program, members can again bid on auction items. We will try to end the bidding by 9:30. Bids are in whole dollar amounts only. Some items have minimum bid requirements. These will be noted with a yellow highlight and a dollar amount on the form. If the bid increment is more than one dollar that will be highlighted as well. At the end of the auction gather your items and pay our Treasurer, Dean, at the back of the room (Dean will double check that minimum bids are met before taking payment). Payment is by cash or check made out to Dry Dredgers (no credit cards or IOUs). If you need to leave before the auction ends and you happen to be a bid winner, we will bring your items to the May meeting where you can then pay for them. Unless other arrangements are made, items not claimed at the May meeting will be forfeited and go into next year’s auction. Items may be donated for the auction on this night but may be retained for next year’s auction at our discretion. We sadly learned that long-time member Steve Felton had passed away unexpectedlyon March 20 at his daughter’s house in Maine. Professor Meyer read an email at the March meeting that he received from Steve’s daughter informing he and Carl Brett of the news. Prior to his passing, Steve had been planning for his next collecting trip down here and had even talked about coming back for the March meeting. We last saw him at our November meeting. He had been a member of the Dry Dredgers since 1971. Steve’s daughter has planned a memorial service for Steve on April 19 at the Cincinnati Civic Garden Center from 5:30 to 7:30 PM. We will keep you informed through the bulletin or by special email messages. Steve was a phenomenon in Dry Dredgers lore and shall remain so. He was amazing in his knowledge of the Cincinnatian formations being able to identify them at new sites at a glance. Steve was an enthusiast for the widespread gastropod genus Cyclonema (or as he called it with his Maine accent - “Cycloneemer”). If you wanted to collect a certain type of fossil, you could ask Steve and he could direct you to a specific layer at a specific site so you could do so. Steve never stopped his studies of the local fossils. Even recently he was investigating the type localities for Onniella meeki (now Cincinnetina meeki) brachiopods with the thought that there was an issue with the current taxonomy. Steve worked with graduate students and professionals throughout his years in Cincinnati. He donated fossils and shared collecting sites. Steve gained professional recognition for his efforts in 1996 when he received the Katherine Palmer Award from the Paleontological Research Institution (PRI) and again in 2001 by receiving the Paleontological Society’s Strimple Award. Both of these awards recognize significant contributions to paleontology made by amateurs. Steve is coauthor on a number of professional papers and abstracts on a wide range of subject matter: articulate brachiopods, inarcticulate brachiopods, bryozoans, cornulitids, epizoans, and gastropods. Steve was one of a group of amateur scientists featured in Discover Magazine in 2008. Steve was a major contributor to the establishment of Trammel Fossil Park in Sharonville. It was Steve who built the retaining wall for the 10 x 10 foot protected shell pavement with edrioasteroids, donating the stone and labor. We would like to hear frommembers who have interesting recollections of Steve. We will accumulate these and put them together as a memorial for him on our website. You can send your thoughts as well as photos to me at paleojack@fuse.net. Watch for a special bulletin in Steve’s memory coming soon. You can find lots more interesting and informative articles in the full members' bulletin. Not a member? Join now. Here's how.